If Milk Powder is too expensive in Sri Lanka, use fresh milk! Oh! My today post started like a political talk, isn’t it? 🙂 No, I hate politics and I don’t want to talk about those politicians in my recipe posts. But I do have my own ideas. This is a post I wanted to share from some time. I remember once I received lot of forwarding emails from friends about rising price of Milk Powder. In this week I am receiving a same email from different friends about a Sri Lankan Milk powder brand and health risk of it. 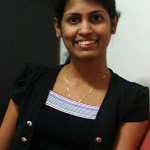 So, finally I decided to share this post and this post is specially for Sri Lankans. I am not sure how many Sri Lankans will read this, but I hope at least one person will get the benefit. Yes, price is rising. Also milk powder is not healthy. Then there should have a solution. One is, don’t drink milk tea, can you? 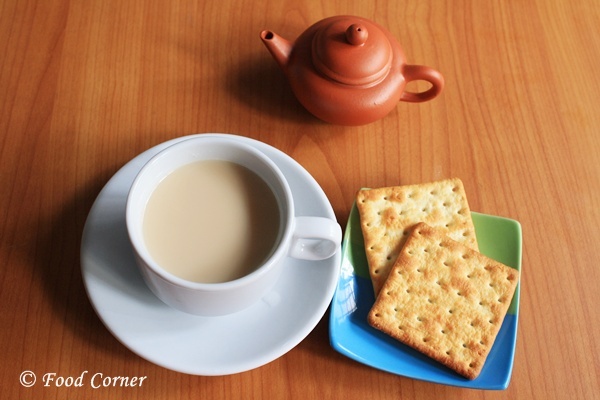 In Sri Lanka, there are people actually they don’t like milk tea because of the taste. But most others want milk in their tea. So, here I talk about those who want milk in their tea. 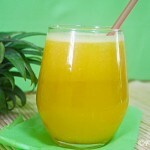 If I say, drink fresh milk, there are few common and practical problems. 1) Where to buy fresh milk easily? 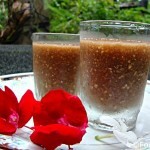 2) How to make a milk tea with fresh milk avoiding the sweetish taste and strong aroma? –yes, personally I don’t like the few teas (with fresh milk) I have tasted in Sri Lanka during my life time. I remember, they were very strong with aroma. I am not sure how they prepared the tea. (My family & relatives), but I didn’t like it at all. It was easily available in groceries and I started to use it and below is my recipe and proportions are as per our taste. The taste was good and even my husband who is a picky eater liked the taste. On the other way, it was budget friendly than using milk powder. Also Fresh milk is always healthier than powdered milk. Now, here in Singapore, we buy fresh milk for the same reasons. That is Healthy, budget friendly and tasty. Please do your own calculations for a month’s milk consumption and see the difference of price when you use fresh milk. I am not going to share the exact price calculation here as I obtained Sri Lankan prices online and not sure how accurate they are. Here I use store bought fresh milk or refer to pasteurized milk (kal kiri) in Sri Lanka. Still in Sri Lanka, we can buy fresh milk from the farmer. There are options! I wish this recipe will be seen by at least one Sri Lankan and at least one Sri Lankan will convert to use fresh milk instead of milk powder. 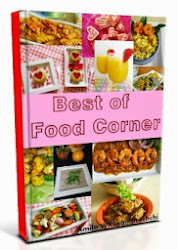 Here are the recipes in both English & Sinhala. 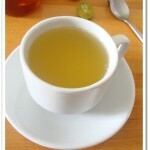 The first recipe gives a perfect cup of tea. 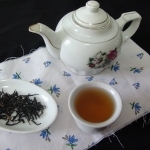 But it takes few more minutes to prepare as we need to steep black tea in a separate tea pot or cup. 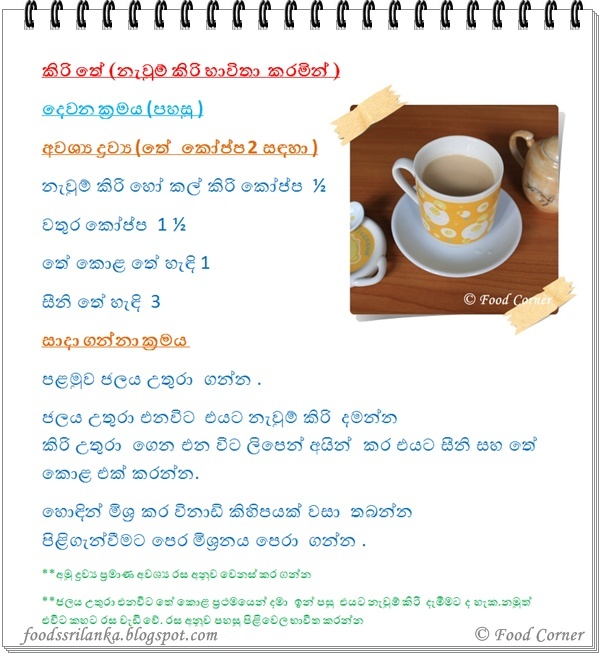 Here is the Sinhala translation for above recipe. Still it is easy to prepare a perfect cup of tea with this method.Step by step pictures are shown below. This method is so easy and tea is made by only using one saucepan.So, number of utensils for cleaning is lesser. If you feel lazy, here is the idea.Still,taste is good with this method.Adjust the quantities as per taste. 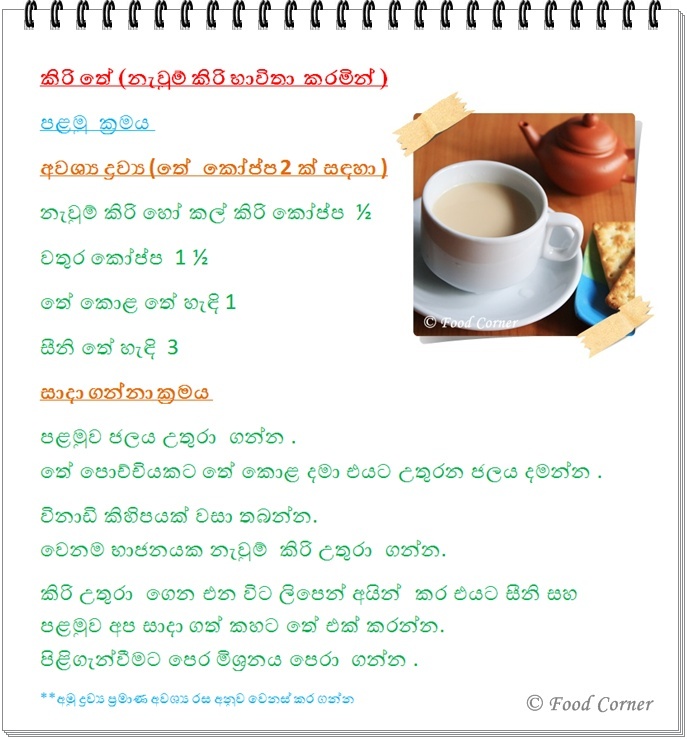 Here is the Sinhala translation for above Milk Tea recipe. 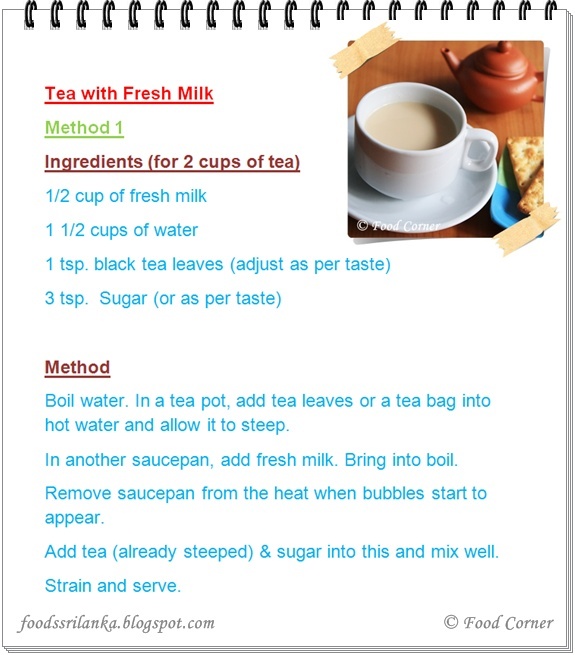 Here are the steps for a milk tea with fresh milk. What do you think? I would like to hear how you prepare a cup of milk tea. Is it using milk powder or fresh milk? Interesting to know that, in SriLanka people like milk powder instead of milk!! Also Amy, you can try adding cardamon(3 nos crushed) & a ginger(1/2 inch crushed) , into the tea mixture while boiling , it is nice & flavorsome too!! 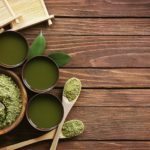 Amazing post about how to make tea? Loved this. yes,i want to try my tea with these spices,i am sure it is tasty…. actually ive never tried tea with milk powder, would love to try it some time. Hi Amy, interesting and great posting. 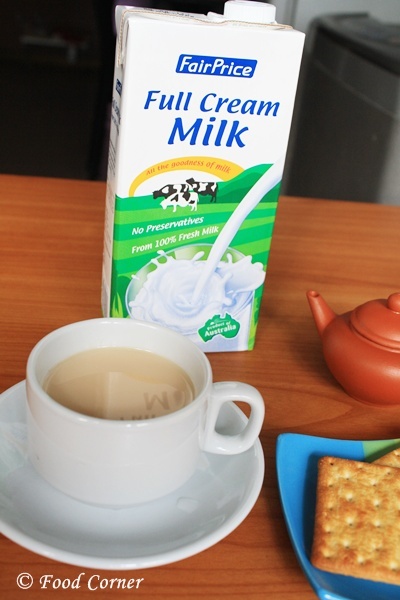 Thank you for sharing the tips of making tea with fresh milk. Love your small tea pot, look so cute. 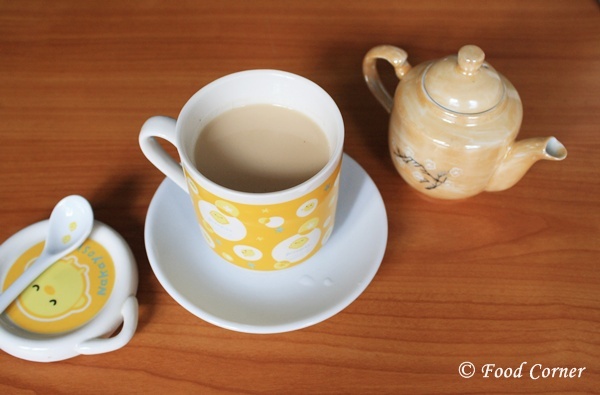 Hi Amelia,thanks for your lovely comment,yes I too love that cute tea pot..
Just today I took pics of my tea. Haven’t posted it yet. Glad to see your tea. Looks really good. such a lovely post Amy..
ceylon tea is the best. Lovely post.Try with ginger and cardamom like pavithra told,you are going to just love that. 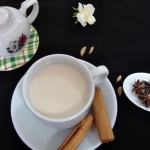 Nice post!..its so amazing that the same tea leaves taste so different when done with the different kinds of milk.I usually prefer with fresh milk.But at times do switch to powdered milk or evaporated milk just to have a change of taste! thanks for the comment,yes the taste of tea depend on the way we steep.sometimes we need a change,so milk powder or evaporated milk is options…. Even I use fair price full cream milk for tea,..
Hi Amy, nice post dear. 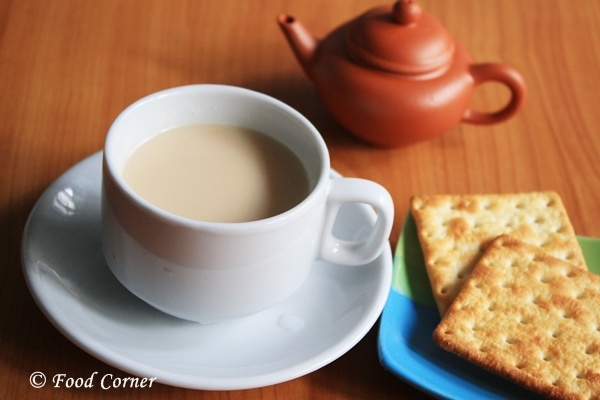 I luv tea and we use fresh milk only, never tried with milk powder. hi amy, i like plain tea or iced lemon tea. i dont drinkk tea with milk, cos i am a lactose intolerant. mata danaganna ona kal kiri nishpadanaya karana vidiya. 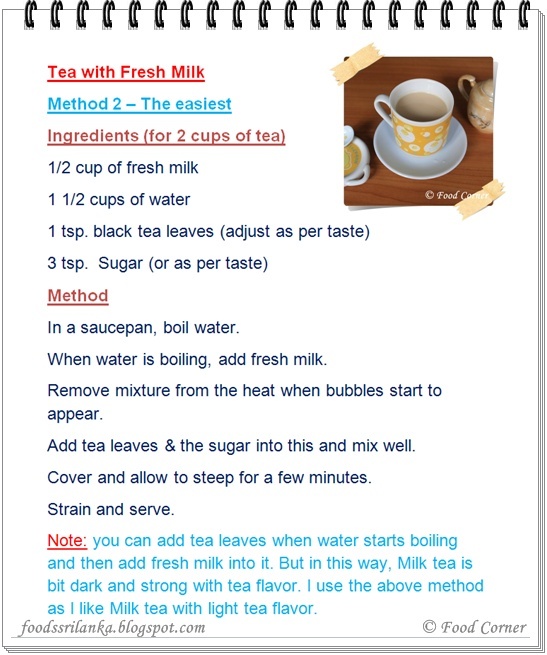 Just looking for a way to prepare tea from fresh milk and stumbled on your post…nice work..im gonna try this and will c..i need darker tea (strong tea and milk).